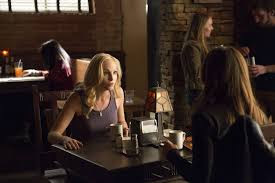 SNEAK PEEK: "The Vampire Diaries: Resident Evil"
"The Vampire Diaries: Resident Evil"
"...both 'Stefan' and 'Elena' are suddenly having unsettling dreams of an alternate version of the life they might have had together. 'Bonnie' has a disturbing encounter with 'Grams', who warns her about frightening changes on the 'Other Side'. "'Enzo' gives 'Damon' unwanted relationship advice, then admits he is searching for a woman he loved decades before while he was held captive by the 'Augustines'. 'Liv' enlists 'Matt', 'Jeremy' and 'Tyler' to help track the 'Travelers' and keep them from taking control of 'Mystic Falls'. "Bonnie is hurt and angry when she learns that 'Jeremy' is working with Liv behind her back. 'Luke' shows up at the 'Salvatore' house and explains what he knows about 'Markos' and the Travelers to Damon, Elena and Enzo. "Matt has a terrifying encounter with inhabitants of the Other Side. Finally, when Damon finds Markos, he is both relieved and disturbed by what Markos has to tell him..."